Read a notice of sale. Buy a mudcrab from Calcelmo. Once you've installed the Dwarven Armored Mudcrab Creation, you will receive this quest and a notice of sale, which directs you to talk to Calcelmo in Understone Keep. 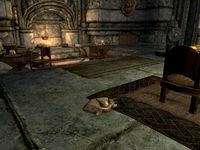 Travel to Understone Keep in Markarth and meet Calcelmo in the ruins section of the keep. From him, you'll be able to purchase the ownership deed. Once you've done so, you'll find the Dwarven Armored Mudcrab beside the arcane enchanter. You'll also receive a spell tome that teaches you a spell to teleport the mudcrab to you. The mudcrab serves as an animal follower, with the added ability to carry items and allow you to send it to specific locations. 0 I've received a Notice of Sale from Calcelmo. I should read it and see what it's about. 10 Calcelmo has found a Dwarven Armored Mudcrab during his excavations, and has offered to sell him to me. I should head to Understone Keep to speak with him, and purchase the Mudcrab. 20 I've purchased a Pet Dwarven Mudcrab from Calcelmo. I should talk to him, and either send him to his new home, or bring him with me. 30 Finishes quest Calcelmo found a Dwarven Armored Mudcrab during his excavations, and offered to sell him to me. I obliged, and now keep him as a pet, who I can bring with me, or send to any of my homes, or main cities. On the PC, it is possible to use the console to advance through the quest by entering setstage ccBGSSSE010_PetPurchaseQuest stage, where stage is the number of the stage you wish to complete. It is not possible to un-complete (i.e. go back) quest stages, but it is possible to clear all stages of the quest using resetquest ccBGSSSE010_PetPurchaseQuest. This page was last modified on 7 April 2018, at 09:31.